Join the discussion on our forums! Come discuss Chameleos over in our dedicated Chameleos discussion topic. Each turn this is in your hand, transform it into a card your opponent is holding. He's everyone you want to be. This card provided very useful data for my book "N00btraps and wishful thinking". Just compare the poll results with the actual stats of the card. Amazing! Will anyone learn from the experience? I would not hold my breath. edit: crap, just found out he literally changes into another card each round. Thought he retained something of his reptile form till you use him. Favourite Witchwood card! The golden art is gorgeous but I'm poor (and I would only be able to see it on the turn I drew it anyway). I think it's my favourite card in the set (tried it in Arena, was awesome) and I'm gonna craft it. Crafted her(?) and i love her. So nice to see your enemy's hand and choose the moment to turn your own enemy's spell/minions against them. Really want to craft this but it's too early in Meta and need to save dust for more important legendaries, always low on dust since I never get any legendarys from opening, 4 legendaries in 140 packs. Works with adventures bosses with OP spells ?? Got it from a pack and tested it right away: she's up to expectation. Facing some unidentified Shaman (would have thought element), receives Chamelon in T1. At the T3, I had seen enough to know he was evolve and that he had a least 1 (and probably 2) frogs in hand. I played so I baited it out with a taunt dragon before dropping my Lich King on T8. Clearly shifted the balance of the game. Of course,the impact of the card depends on how early you can get your hand on it, but clearly an amazing tool in mid / control match-up. It can be a The Final Seal. Rin combo for 15 mana instead of 41. You could also just get Azari, the Devourer. For the memes! great for my Thief Priest. Time to finally craft a golden Archmage Benedictus. see you in legend bois. Honestly this could be good b/c it's a less RNG version of Shifter Zerus and it allows you to see what minions your opponent is holding. This has probably already been answered, but what happens if the opponent has no cards in hand when his effect triggers? 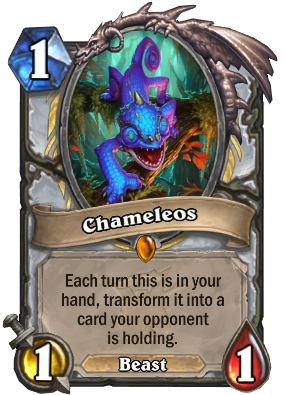 Does Chameleos stay as the card he last transformed into, or does he change back to normal? I would expect it to go back to "normal"